Our mountain condo, part of the Summit at SilverCreek Condominium Complex, is located in picturesque Granby Ranch, Colorado. 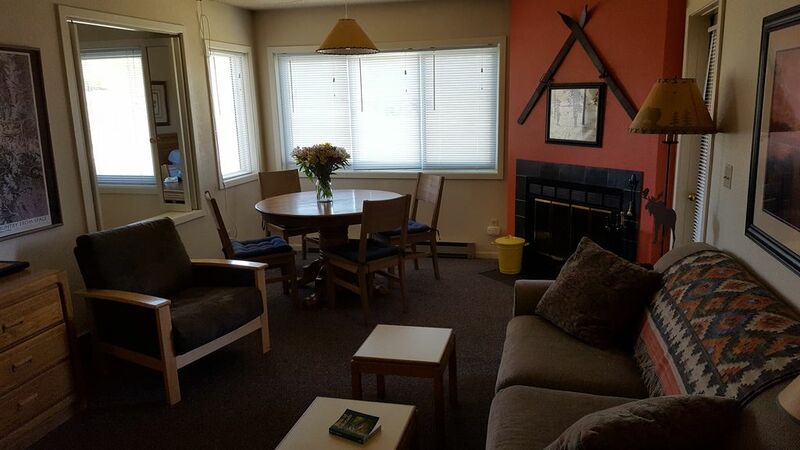 Just 100 feet from the chair lift, our unit offers ski-in/ski-out access to the Granby Ranch Ski Area. Its private balcony overlooks the Headwaters Golf Course which is part of Granby Ranch four-season, family-oriented resort. Our Summit unit at Granby Ranch, is on parking lot level and it is just a few steps from parking space to the front door. We have updated our mountain retreat with new mattresses, quilts, sofa bed, chairs, drapes, and art. There is also a wood-burning fireplace in the living room. Our amenities building is unfortunately closed for the 2019 season. But, guests have access to all of the amenities at the Inn at Silvercreek including their pool, hot tubs, fitness center, and game room. There is a wireless internet signal in the amenities building and at the Base Lodge. Granby Ranch,located along the Fraser River between Winter Park and historic Grand Lake village, is within a short 20-minute drive from Rocky Mountain National Park, Hot Sulfur Springs, Winter Park/Mary Jane Ski Areas, and three additional area golf courses (Pole Creek, Grand Elk, and Grand Lake). The region has vast mountain areas ready to explore with hiking, fishing, biking, kayaking, boating, cross-country skiing and horseback riding. Numerous visitor services are available in the quaint mountain town of Granby. NOT WHAT YOU ARE LOOLKING FOR? PLEASE SEE ALL OF OUR LISTINGS. You might be able to 'pick up ' an Xfinity log in if you are an xfinity/comcast customer. There is Wifi in the amenities building and at the base area lodge as well. The communication from Becky was great even during the stay. There was a little confusion as there should have been WiFi but had to be a customer of another company to log in. Overall it was a good place close to the ski lift and quiet place to enjoy a get away. I would stay again. Great spot and a great time! Granby! What a hidden Gem! Or at least it was new for us. So close to Winter Park but so much less crowded and more enjoyable! Great skiing and I have NEVER stayed anywhere so close to a lift! Just literally a few steps and I was riding up to ski! This place was very very nice, had everything we needed and the owners were very nice and responsive! I highly recommend this. Perfect weekend getaway. Well stocked with linens and kitchenware. Even had spices in the cabinet. Deck faces west so we had great sunset views. Older, outdated furnishing but very clean and comfortable. We will definitely stay there again. Very comfortable quiet condo for our visit to Rocky Mtn National Park. This was a great alternative for a visit to Rocky Mtn National Park compared to the business of Estes Park. Condo was comfortable, well decorated and quiet. Kids enjoyed the pool. Close to gas and a grocery store. Only downside was that wifi was only available at the amenities center across the street, not in the condo. A dated property, but close to the ski lift. This was an older property with dated décor, but worked fine for our short weekend trip. The floor in the living area was very squeaky. The master tub/shower combo was small and slow to drain. The kitchen was well stocked with several dishes, pans, and cooking utensils. The condo was spacious for our family of five, and we enjoyed having two bathrooms. The ski lift was close and was open over President's Day weekend when we were there. However, from what others told us, the lift had not been open for much of the season. I would have been upset if the lift had been closed while we were there. That was the main reason we chose this property was because of the proximity to the lift. I would recommend calling Granby Ranch to see if the lift is open prior to booking during ski season. This was not something that I thought of when booking, nor was it mentioned by the property manager. A ski-in/ski-out property is great, but only if the lift is open! Overall, we enjoyed our stay! The owner has actually done many upgrades to this unit over the years. Due to lack of snow this season only, the lift was closed early season. Many of of us did not even know as it has always been open for most of the season. Snowshoeing, Dining, Hot Springs, On site Skiing and Golf! Near Pole Creek, Grand Elk, & Grand Lake Golf Courses! Near Winter Park, & Mary Jane ski areas.